FKH is the southernmost migration monitoring project in the continental United States, and is the sole project of its kind in Florida and the Southeast. Continually tracking the movements of birds as they prepare to cross the Florida Straits and Gulf of Mexico into the Caribbean – a region with few monitoring sites – is of critical importance to understanding and protecting these descendants of theropod dinosaurs. Few sites in the North American migration monitoring network display the conservation and ecological significance of the FKH sites. The magnitude of migration in the monitoring area is one of the most significant in the country (including migrants of 18 species, Lott 2006, Ruelas 2008), and one of the most important studies for falcons of three species. No other project in the world has documented higher numbers of Peregrine Falcons in a single day (651 on October 10, 2012) or an entire season – 3,836 during the fall of 2012. Indeed, FKH is one of the few projects to document the passage of Swallow-tailed and Mississippi Kites, and Short-tailed Hawks. Additionally, it is one of the few projects documenting the movements of important non-raptor species such as the threatened White-crowned Pigeon. Raptors occupy the top of several food chains, making them ideal indicators of environmental fluctuations. Because of their relatively large size and diurnal migratory habits, their passage tends to be more easily monitored compared to songbirds, which are smaller and migrate mostly at night. The study of raptors in the field has developed as science, conservation and recreation the world over, with hundreds of ongoing migration monitoring projects in North America alone. Most hawkwatches now use standards developed by the Hawk Migration Association of North America (HMANA). Of the 26 raptor species recorded in the state of Florida (five still under review by the Florida Ornithological Society Records Committee), 20 have been documented from the Florida Keys. Seventeen of these species are regularly monitored during fall migration by FKH in Curry Hammock State Park. Most raptors migrate seasonally during spring and fall. A prominent drive for this behavior is the seasonal change in food base. Raptor migration occurs primarily by day, mainly as a movement between latitudes, during which birds may cover long distances from “north” to “south” and vice versa. Unlike waterfowl or passerines, most raptor species migrate singly, using a number of migratory flyways that are not necessarily the same during spring and fall. Raptors must save energy during migration in order to cover long distances; this can be achieved by using thermals — up-rising air currents generated by sun-heated land surfaces. Straddled between the Atlantic Ocean and Florida Bay, the Florida Keys lie only a few inches above water. This flat ridge of limestone outcroppings curves southwest into the Tropics. Although raptors regularly use updrafts from hills or mountain slopes to save energy, this is obviously not possible in the Keys. Over the Keys, raptors soar within columns of up-rising air currents. Height is continuously gained until the rising column cools down with altitude, and the birds must glide down to another newly formed column and start gaining height again. This way, a bird may cover up to 373 miles per day. Because of this flight strategy, and the fact that water surfaces do not generate rising air currents, most raptors avoid flying across water stretches wider than 15.5 miles. Following the narrow chain of the Keys, raptors have only a sliver of thermal-generating surface between two bodies of water. Because of a considerable narrowing of landmass in the Middle Keys and a lack of alternate routes southward, the flight path of migratory birds of prey tends to be most concentrated here, hence the strategic selection of the Curry Hammock State Park location for the monitoring raptor migration. The Middle Keys tend to be little more than a half-mile wide in the area surrounding the FKH location, and offer a great vantage point for the observation of birds of prey up to 1.6 miles in distance. FHK follows the standard protocols for data collection in use in more than 200 sites in North America (HMANA 2011). Migration counts consist of hourly records of a series of variables of weather and observation conditions, and its corresponding hourly tally of migrants recorded. These general standards are refined to fit the conditions of the flight at each site; e.g., FKH requires two observers during the field season, its optimal count period occurs between 15 September-15 November (in order to include ≥95% of the migration window for selected species), and specific instructions to document site routines are critical at this site, which experiences unique migration features. Seasonal migration count data from most North American monitoring sites is stored in the online repository HawkCount.org (visit the site for recent information on counts at FKH during the current season). 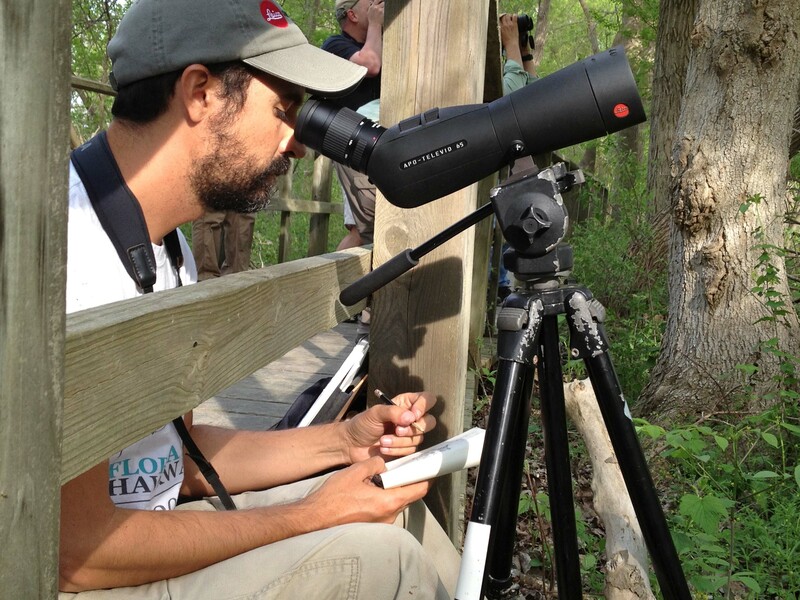 Long-term data from this online database is used to analyze raptor population trends. Managed by HMANA, this electronic archive is federated with other large observational data repositories, such as Cornell University’s Avian Knowledge Network and the Global Biodiversity Information Facility. It provides safe and permanent archival access with some analytical tools available for the general public, and data accessibility for research and conservation applications. For more information, visit the Florida Keys Hawkwatch website.